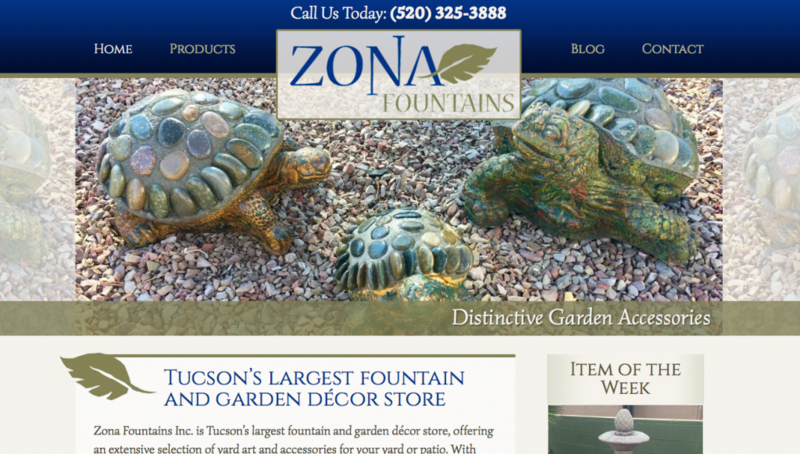 Here at Zona Fountains, we believe in protecting and preserving your fountain. With our years of experience, we’ve found the best way to keep your fountain looking new is to purchase a fountain cover to preserve your water feature. Some customers wonder why we recommend fountain covers, as they are typically reserved for harsher winter climates. 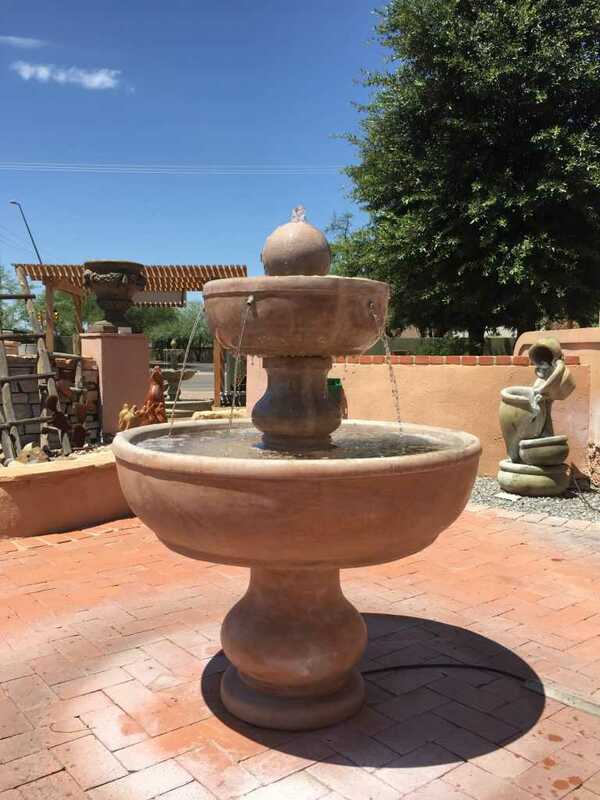 We have found that here in Arizona it is just as important to protect your fountain from the harsh summer sun, as well as during monsoon season. Both times during the year temperatures swing from day to night, which can cause an unwanted algal bloom. During monsoon season, large amounts of rain water can overfill and even knock over your fountain. Many of these yearly events warrant the use of fountain covers here in Arizona as well! Some of our customers who are seasonal residents of Arizona find fountain covers essential to protecting their purchase during the months they are not here to care for it. Some customers have also found using the covers aids in resisting pesky mosquitos from laying eggs and multiplying in the stagnant water. At Zona Fountains we carry Henri Fountain Covers made from durable, reinforced polyethylene, which is weather resistant and u.v. stabilized. 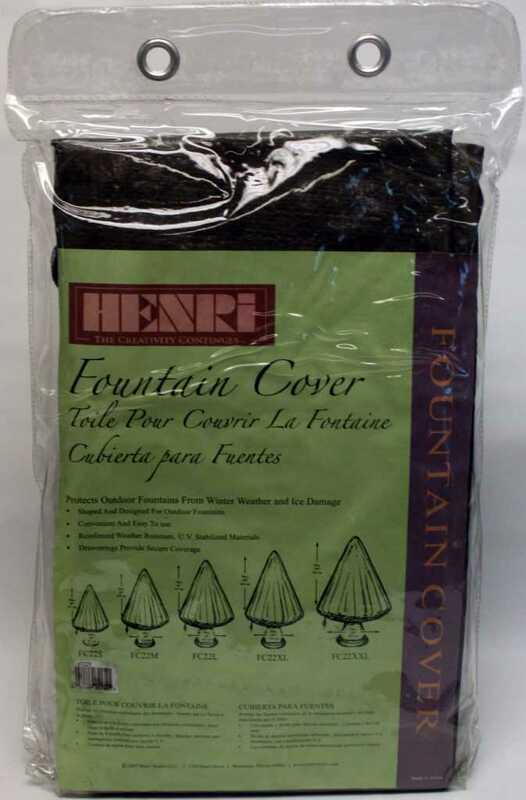 Henri’s covers have nylon drawstrings integrated into the fabric to ensure a snug fit over your fountains. Stop by today and see how you can benefit from purchasing a fountain cover. Our experienced staff members look forward to seeing you! 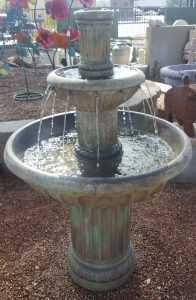 Shop our wide selection of fountains and birdbaths today! Tucsonians accustomed to monsoon season know that all the added water and moisture provides a breeding ground for mosquitos. Owners of fountains have the added problem of readily available water for these pesky insects. Fortunately, the fountain experts at Zona Fountains have got you covered! 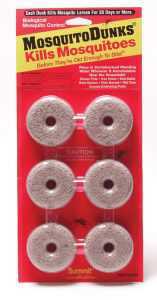 We recently started carrying Mosquito Dunks and Mosquito Bits by Summit Chemical. Both of their mosquito repelling products are safe for plants and animals and proven to keep those pesky insects at bay! The active ingredient in the product works to kill larvae before they are able to develop into full grown mosquitos. Stop by the store today and pick up one of these awesome products in time for your next summer barbecue! Safe for Plants and Animals! Shop our line of fountains and garden decor today! We have been brainstorming ways that we could bring the dimension of our store to the face of our blog. In doing so, we decided that we should include video footage of some of our fountains in full swing. Please take a look below at our very first video featured fountains. We hope you are pleased with the two we chose to showcase, and do continue to look back from time to time to see other fountains that we have available! Consequently, it looks like an uninvited guest has decided to set up shop inside your fountain. Depending on environmental conditions, untreated algae can grow back every few weeks even after cleaning your fountain. An algal bloom will cause a fountain to look unsightly and may even interfere with the functioning of the fountain itself. Luckily, a few drops of algaecide from your friendly staff at Zona Fountains will clear your fountain water of the green menace and prevent any future blooms down the line. Our algaecide is also non-staining, so you won’t need to worry about ruining the delightful hue and glow of your fountain. Think of algaecide as a regular vitamin regimen to keep your fountain happy and healthy. 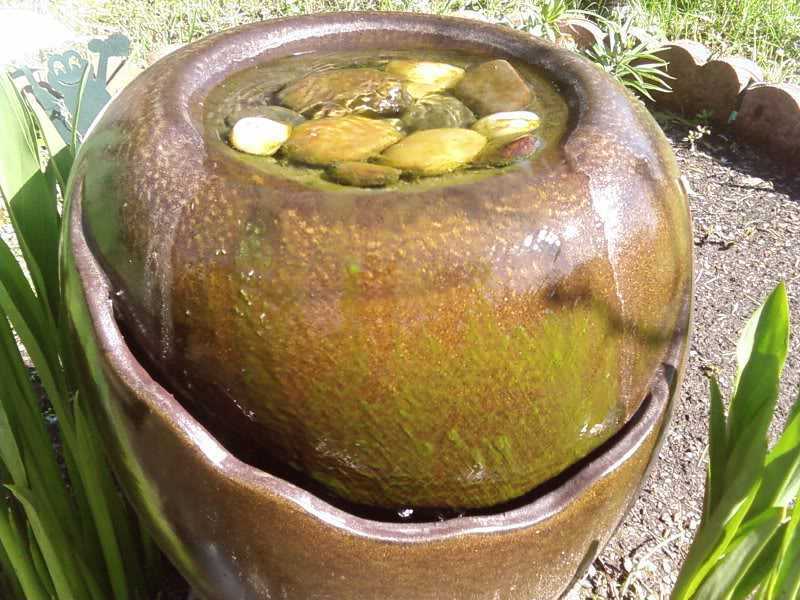 Place your fountain in the shade, as direct sunlight enables more rapid algae growth. Also, consider placing a cover such as an umbrella or awning in the area near your fountain to help provide shade if no natural shade is available. For smaller fountains consider using distilled water rather than tap. Tap water and even filtered water still have natural impurities present in them which can encourage algae growth. Most of all don’t forget your local experts at Zona Fountains don’t just sell fountains, we stand by our products and will help keep your fountain running well. Stop by or give us a call today to see how we can help keep your personal oasis running for life. 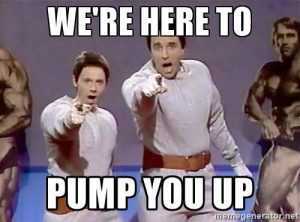 Zona Fountains is here to pump you up! 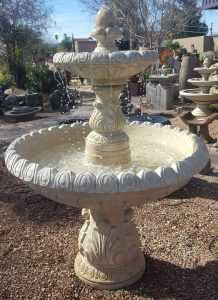 Let’s say you recently purchased a lovely new fountain for your home or garden. First things first, congratulations on your excellent taste! Now all you need is a pump for your new fountain to move the water up, down, and all around. Proper water movement helps to compose that lovely tranquil ambiance we seek in a fountain. Otherwise, you’ll have yourself a new birdbath instead of a new fountain. The fountain pump is like the engine under the hood of a classic car, it doesn’t see the light of day too often, but it’s the piece that brings the whole show together when all is said and done. Lucky for you Zona Fountains is the one stop shop for fountain pump expertise. It’s what we do at Zona Fountains. There are two kinds of pumps we keep on hand at Zona Fountains; submersible pumps, and inline pumps. Submersible pumps, as the name implies, are pumps that you plug in and toss into the fountain. Up front, they tend to be cheaper than inline pumps, but they can be more of a hassle to maintain as time goes on. Inline pumps, on the other hand, are not as “plug-and-play” as submersibles. You’ll need to layout and install all the necessary piping. Once everything is in place, however, any maintenance down the line is much less of a headache. Inlines also tend to be a bit quieter than submersibles. Give us a call or stop by and let our expert staff help you build your own oasis today! Posted in Zona Fountains News	| Comments Off on Zona Fountains is here to pump you up! While we all can’t make it to see the Trevi Fountain in Italy. 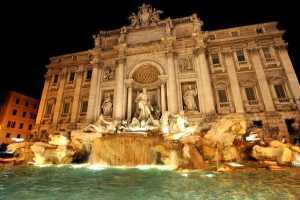 We have some great fountain choices to pick from, so you can bring home your own little slice of Rome. Let us help you create the perfect staycation this Valentine’s Day. 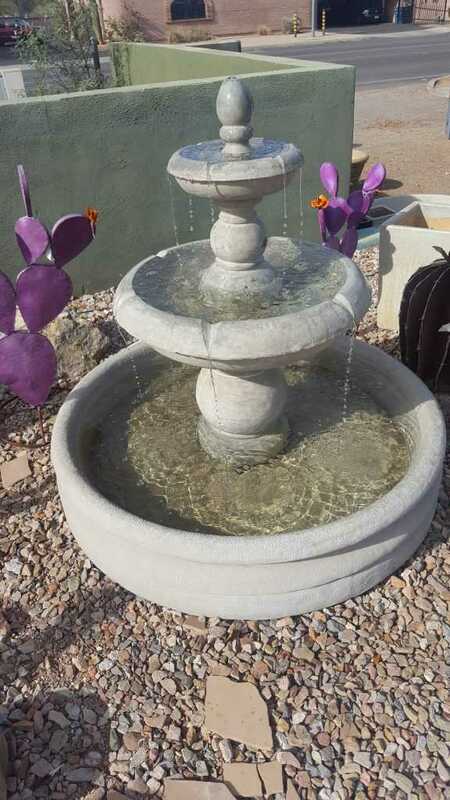 With a fountain, it can help create a romantic feeling in your yard. Here are three great examples of romantic fountains. The Fluted Fountain. With a Greek feel this fountain has great sound. It can turn any yard into a little Mediterranean paradise. We have the Rose Fountain with Doves. These love birds are the perfect way to symbolize your relationship with your significant other. 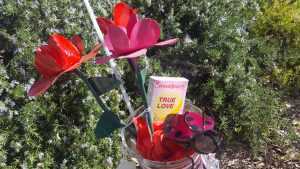 What better way to show harmony in your yard than with these love birds. Finally, we have our International Fountain. 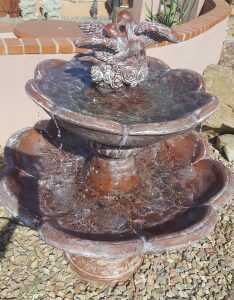 This a traditional style fountain great for any occasion. This will give your yard a great classic look. 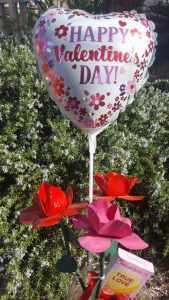 We also have a great Valentine’s Day Special. 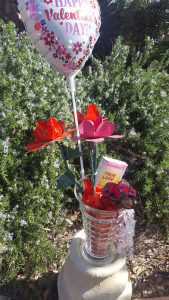 A gift set with some of our fantastic metal art. While a frozen fountain is beautiful to look at it will cause more harm than you realize. For that, we and the manufacturers both recommend draining the fountain when temperatures drop below freezing. When the water freezes, it will expand and may result in cracking your fountain. Water may also be restricted from the pump causing it to burn out. 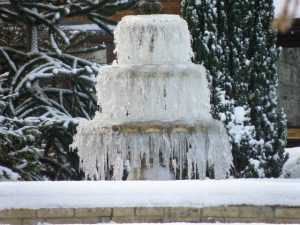 If you expect rain or snow during the freeze we also recommend that you cover the fountain. That will eliminate any possible cracks from occurring, or having to replace the pump. -Run the fountain all night. Running water freezes at a lower temperature. If it only drops below freezing for a brief period of time this may suffice. -Place a light, or more than one light, under the fountain for the night. The heat generated by the light may be sufficient. -Place a heater near the fountain for the night. Here at Zona Fountains, we believe the best course of action is to drain the fountain. This will help prolong the life of the fountain. 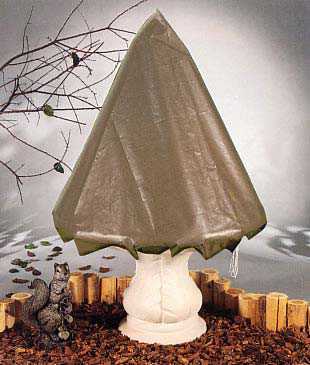 Please contact us if you have any questions or wish to purchase a fountain cover. Thank you for choosing Zona Fountains! We would like to start off with a warm welcome to our new website! Please explore our wide selection of fountains and the various vendors we work with, such as Fiore Stone. Our large variety of garden accessories along with our selection of pottery will help decorate your backyard oasis. Stop by our store today to speak with an associate about how you can transform your landscape with some of our unique products! Check our blog often for news, information and promotions!